Kailyn Sanders, a fourth-year advertising major at Grady College, has been named to the 2018 American Advertising Federation of Most Promising Multicultural students. Every year the American Advertising Federation selects 50 multicultural students nationwide that they feel represents some of the top emerging talent in the advertising industry. Through this program students attend a four-day recruiting conference where they meet and learn from top professionals in the advertising industry, visit different advertisers and agencies and interview for full-time positions. Sanders throughout her studies has capitalized on the different experiences Grady offers to students. In the summer of 2015, she participated in the Cannes Lions Festival of Creativity study abroad where she learned more about the advertising and public relations industry. She also serves as the chair of diversity and scholarship for UGA’s Ad Club by ensuring that there is diversity within Ad Club’s programming, guest speakers and members. This is seen in a commitment by Sanders to promote diversity and multiculturalism. 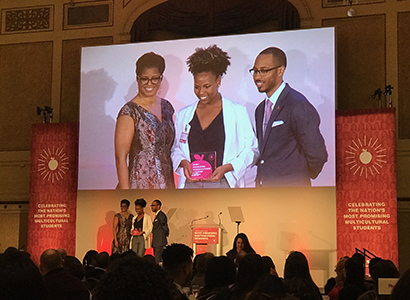 In addition to this honor, Sanders has attended numerous industry conferences such as the Publicis Multicultural Talent Pipeline and UGA’s AdPR Academy: Advancing Diversity at Moxie. This opportunity was an “experience of a lifetime” as the AdPR Academy taught Sanders how to start her career as a young professional and how to differentiate herself from others.